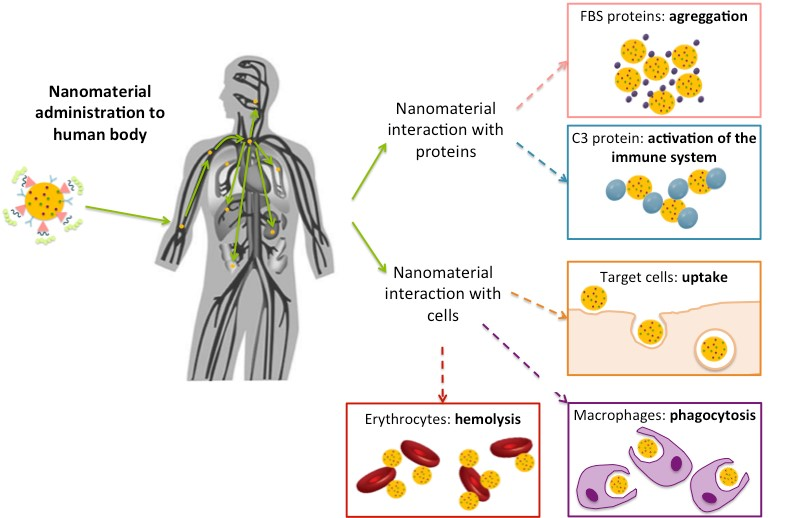 This review summarizes the main techniques used to assess the interaction of nanomedicines with biological systems, highlighting their advantages and disadvantages. The translation of knowledge from novel designed nanosystems at a research laboratory scale to real human therapies is usually a limiting or even a final point due to the lack of systematic studies regarding two aspects: nanoparticle interaction with biological components and nanoparticle cytotoxicity. Conxita Solans, Scientific Director of Unit 12 of NANBIOSIS together with researchers of her group, Colloidal and Interfacial Chemistry of CIBER-BBN and IQAC-CSIC and the Department of Pharmacy and Pharmaceutical Technology, University of BarcelonaIn have published the research paper “Versatile Methodology to Encapsulate Gold Nanoparticles in PLGA Nanoparticles Obtained by Nano-Emulsion Templating” in the journal Pharmaceutical Research. The scientists have shown that a novel and very versatile methodology has been developed for the production of polymeric nanoparticles loaded with gold nanoparticles. In this work, gold-nanoparticles (AuNP) have been encapsulated in polymeric nanoparticles using a novel and versatile methodology based on nano-emulsion templating, which has allowed to encapsulate high concentrations of gold nanoparticles (> 100 pM). Polymeric nanoparticles loaded with AuNP with sizes lower than 100 nm have been obtained using this methodology. In addition, a safe and easy methodology for the phase transfer of gold nanoparticles from aqueous to organic solvents has been developed. The biocompatibility of the designed nanoparticles with both cultured cells and erythrocytes has confirmed their suitability to be intravenously administered Therefore, these nanoparticles represent novel advanced imaging systems for biomedical applications. Dr. José Luis Pedraz, head of Nanobiocel group and Scientific Director of Unit 10 of NANBIOSIS, participates in the public-private collaboration BIOTAPE project that will develop a new bioadhesive for its application in pterygium surgery to improve the currently used surgical techniques in the treatment of this eye disease that affects the conjunctiva and cornea. The main cause of pterygium is the lack of lubrication of the eye by the tear film. This lack of lubrication may be due to various external factors such as excessive exposure to sunlight, harsh environmental conditions or even allergens, which causes dryness and subsequent irritation in that area. Pterygium grows in the form of fleshy mass on the cornea, being in these cases the application of surgery to extract it. So far the technique with better results is to place a graft of the conjunctiva of the eye itself in the place of removal of the pterygium, fixed by sutures or tissue adhesives. In the BIOTAPE project, 3D printing technique will be used to manufacture the new bioadhesive that will help reduce the current complications among which we can highlight the high rates of recurrence of the disease, surgical and post-surgical complications and the cosmetic result, not always satisfactory. The new project, to be developed over the next three years, is funded with a budget of 513,000 euros by the Challenges-Collaboration program of the Ministry of Economy, Industry and Competitiveness and the participation of three Spanish companies (AJL OPHTALMIC, BRECA Health Care and Bilboftal-ICQO), the University of Miguel Hernández in Elche, CIBER-BBN and unit 10 of NANBIOSIS-ICTS. On March 15, Jesús Izco presented NANBIOSIS at the conference organized by CIBERSAM on Therapeutic Innovation. The event, that took place in the Hospital del Mar of ​​Barcelona, ​​with an audience of about 80 people, was attended by Jesús Izco, coordinator of NANBIOSIS as a guest to talk about Innovation Platforms. Jesús Izco explained the opportunities offered by the ICTS NANBIOSIS as a Platform for Research and Biomedical Innovation, giving examples of private-public collaboration in competitive calls (INNPACTOP, Challenges and H2020) in which NANBIOSIS has participated and explained the design of the new Nanomedicine Cascade Characterization Service, in which NANBIOSIS is working on. CIBERSAM is the CIBER Scientific Area dedicated to the study of mental disorders such as depression, schizophrenia, bipolar disorder, anxiety disorders and mental disorders of the child and adolescent or therapeutic innovation. Its mission is to provide answers and solutions to better understand the etiophysiopathology of mental disorders, improving the promotion of mental health, prevention and current treatments and thus improve the quality of life of citizens. CIBERSAM’s Therapeutic Innovation program has a long tradition in the identification and development of new therapeutic strategies, both pharmacological and non-pharmacological. 2017 is the year of the X Anniversary of the European Research Council (ERC), created to finance research projects of excellence at the frontier of knowledge of any scientific discipline. 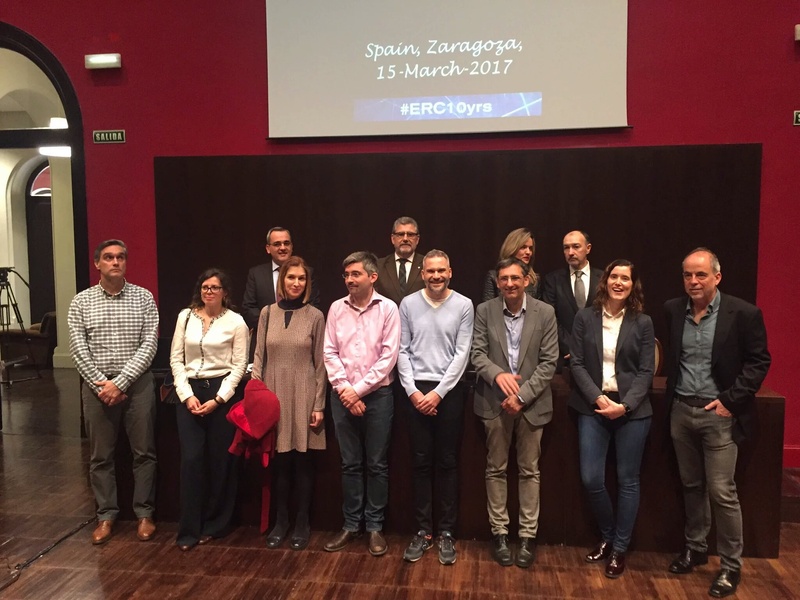 The structure of the ERC consists of an autonomous scientific council made up of 22 distinguished scientists supported by an executive agency that is responsible for implementing the program, organizing the evaluation and managing the aid. Jesús Santamaría, Scientific Director of Unit 9 of NANBIOSIS, received an Advanced Grant, on the senior side, with a funding of 1.85 M. for his project Héctor. Manuel Arruebo, researcher of the group of Nanostructured Films and Particles, coordinator of Unit 9 of NANBIOSIS, obtained the Consolidator Grant endowed with 1.5 M of euros with a Nanobiomedicine project. Esther Pueyo, researcher of the group BSICoS, coordinator of Unit 27 of NANBIOSIS, obtained an ERC Started Grant for her Modelage project, financed with 1.5 M euros. Pablo Laguna, Scientific Director of Unit 27 of NANBIOSIS considers the added value offered by the ICTS NANBIOSIS in an interview at February 2017 CIBER-BBN Bulletin. Pablo Laguna Scientific Director of CIBER-BBN during 2011-2015, played an important role in the creation and impulse of NANBIOSIS, signing a scientific and technological cooperation agreement with Jesus Usón Minimally Invasive Surgery Center (JUMISC) in November 2011 that served as the basis for the creation of NANBIOSIS and its incorporation to the Map of Spanish ICTS (Singular Scientific Technological Infrastructures) in 2014. Laguna also explains for the CIBER-BBN Bulletin the research lines of the BSICoS group, coordinator of unit 27 of NANBIOSIS, which focuses on the search for non-invasive indicators to predict the risk of arrhythmias, modelling and simulation of cardiac electrophysiology, evaluation and quantification of the activity of the autonomic nervous system and the processing and characterization of biomedical signals in respiratory diseases. 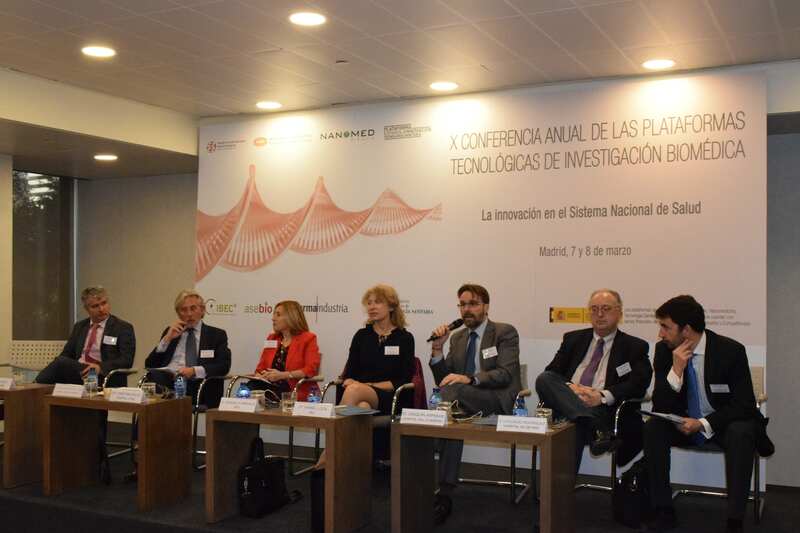 On March 8, 2017, the 10th Annual Conference of Technological Platforms of Biomedical Research took place in Madrid on the theme Innovative Medicines, Nanomedicine, Health-care Technologies and Biotechnology Markets. Jesús Izco, Coordinator of NANBIOSIS, participated in the round table on New Public-Private Cooperation networks, together with the Scientific Directors of the recently created CIBER Areas of Fragility and Aging, Oncology and Cardiovascular Diseases, as well with as the coordinators of the Networks of Clinical Essays and the network of Discovery of Drugs. The coordinator of NANBIOSIS explained the opportunities that the ICTS offers as a Network of Excellence for Research and Biomedical Innovation, especially in the fields of nanomedicine and biomaterials and gave examples of private-public collaboration in competitive calls (INNPACTOP, Challenges and H2020) in which NANBIOSIS has participated. Finally, Jesús Izco outlined the ICTS strategy to improve cooperation with companies and spoke about the design of the new Nanomedicine Cascade Characterization, among others services, in which NANBIOSIS is working on. Researchers of Unit 26 of NANBIOSIS participate in the design and evaluation of the cellular level of a new hybrid material for the creation of intelligent-scaffolds implants that open the door to a more efficient treatment of infections and bone tumors. The main novelty is the incorporation of a mesoporous matrix of silicon, calcium and phosphorus oxides, with molecular gates that would allow the controlled release of substances stored inside the pores, such as antitumor drugs or antibiotics. A molecular gate is a mechanism whose opening depends on certain external stimuli, in this particular case the drugs would only be released in the presence of enzymes associated with a tumor or a infection in the bones.Nowadays there are scaffolds that allow the slow release of a drug, but this is produced automatically and non-specific. Lorena Polo, Natividad Gómez-Cerezo, Elena Aznar, José-Luis Vivancos, Félix Sancenón. Daniel Arcos, MaríaVallet-Regí, Ramón Martínez-Máñez. Molecular gates in mesoporous bioactive glasses for the treatment of bone tumors and infection. Acta Biomaterialia. http://dx.doi.org/10.1016/j.actbio.2016.12.025. ESTEVE, a chemical – pharmaceutical group leader in Spain and with an important international presence, has developed new inhibitors against pain. Collaboration with scientific expertise of the Protein Production Platform and the ALBA Synchrotron will allow studyingthe interaction of these inhibitors with its potential target. The results of the research may help to the better understanding of the effects of the inhibitors and will provide key information to improve their properties.